The thrill of helping organizations like yours achieve success through Organic Search Engine Optimization (SEO) services and strategies, is what drives us every day. In today’s digital world, engagement-trust and organic visibility are becoming instrumental to converting searchers to buyers. After helping so many clients achieve incredible results online, it makes us cringe to see other SEO services waste your potential on ineffective tactics. Our philosophy is simple. We leverage industry leading on-site optimization processes with “white hat” manual link-building strategies to send buyer traffic to your website. We then audit your conversion rate and increase your leads and revenue with A/B testing of landing page creative and messaging. All this to ensure that your internet marketing budget is affecting the Key Performance Indicator (KPI) that matters most: your bottom line. 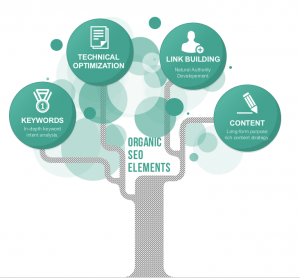 Our technical SEO optimization updates are steady and continual so that updates are always occurring on your website and campaign. This high-touch strategy is one of the reasons why it is so effective and lasting. We have real SEO strategists here in Arizona that do everything by hand in a prioritization they see as most effective for each client. The natural improvement occurs on a continuous 2-3 month cycle so search engines always see progression and momentum. We have found our clients ranking results to be much higher with this unique and “organically grown” process. We love to do it and we hope you love the results. Below is a brief rundown of the tasks that take place on the onset of your campaign. Site page load speed and image load time assessment and optimization. Light technical optimization happens when quick wins are found during this discovery process. We have a proprietary process were we boost each client’s existing links by refreshing their presence to online aggregators and search engines this has been initiated for you. Initial linking opportunities identified and sent to our manual link builders by your strategist. Guest Posting Outreach begins and influencer relations ships are created. Competitors indirect and direct are identified and their backlink profiles are perused for opportunities. High Quality Directory, Web 2.0, and social profiles placements are attained. Our internal manual link builders also start their vetting process for linking opportunities. Webspand is an organic SEO company that creates custom SEO strategies for attaining higher rankings in Google and other search engines. Organic Search Engine Optimization (SEO) involves on-page website optimization, back end coding and architecture optimization with authority development. You can earn revenue with our SEO reseller program.